The 2014 cross country season is upon us with much excitement and anticipation. The runners in southwest Florida were welcomed to one of the toughest courses in the state of Florida along with hot, humid conditions that is traditional for September. Estero’s coach, Jeff Sommer, prides himself on running a first class meet and making the Estero Community Park “one of hell of a course.” Runners are greeted with climbing a hill twice and the famous sand pit that they have to navigate twice as well. Cross country season is always exciting with runners and fans cheering on not just their teammates, but other runners to push through the pain and “catch the next runner.” Running is that unique sport that not just 1st place gets rewarded but every runner feels an accomplishment. It was an 8 a.m. start for the varsity girls. On paper it looked a three way battle between Evangelical Christian’s Sarah Candiano, Barron Collier’s Devin Molloy, and Estero’s Daley Cline. All three were in the lead pack for the 1st half mile, along with Estero’s Megan Slater and Olivia Adams (transfer from Pennsylvania) and Ft. Myers’s Kristilin Gear. When the girls reached the 1st mile marker, Candiano became the clear leader with around 6 minute mile followed by Molloy, Cline, and Slater. Candiano increased her lead over Molloy in the sand pit and the 2nd climb of the hill. As Candiano reached the 2nd mile marker, her lead grew to about 10 seconds. The senior from Evangelical Christian never looked back and cruised to the victory winning wire to wire with a time of 19:40 followed by the sophomore Devin Molloy with breaking 20 minutes at 19:57. Rounding out the top 5 were Daley Cline from Estero with 20:29, Olivia Adams of Estero with 20:38, and Ft. Meyers’ Kristilin Gear crossing the finish line at 20:47. The team battle was a close battle between Estero and a young Lakewood Ranch team. Estero placed 4 in the top 20 including their top two in the top 5 (Cline and Adams) but Lakewood Ranch placed 4 girls in front of Estero’s number 4. 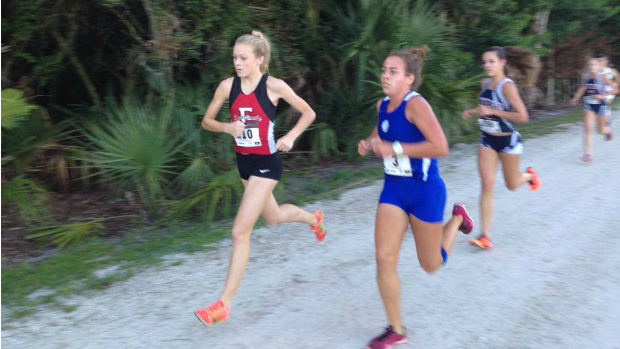 Lakewood Ranch’s number 5, Emma Fazio, placed ahead of Estero’s number 5, Kala Howard. But in the end the top end of Estero provided to be too much and won by 12 points with a total of 72 to Lakewood Ranch’s 84 points. Rounding out the top 3 was North Port with 107 points just edging Fort Myers with 109 points. The temperature was rising as the boys were on the starting line, but the temperature got even hotter on the course between Ryan Rodriguez of Belen and Zack Summerall of Sarasota. Rodriguez jumped out to an early lead followed by 4 of his teammates, but as mile 1 was approaching Summerall broke through the Belen pack and was shoulder to shoulder with Rodriguez. Throughout the rest of the race it was Summerall and Rodriguez jarring back and forth. It wasn’t till the last sand pit where Rodriguez made a final push and put a few steps on Summerall. Rodriguez pulled off a 3 second victory with a time of 16:50. Summerall finished with 16:53. Marshall Dillon of Charlotte High had a fantastic 2nd half of his race, where he moved up 5-6 spots passing the Belen pack, Dillion Vallette of Estero, Tyler Fisher of Port Charlotte, and Belen’s #2, Jamie Lopez. Dillon finished 3rd overall with 17:05. Finishing off the top 5 was Jamie Lopez with 17:11, edging out Tyler Fisher who crossed at 17:12. Belen came out charging right from the gun with 5 guys leading the race in the 1st mile. Slowly a few scattered runners broke the pack up but Belen ended up dominating with only 29 points by placing their top 5 in the top 10 scoring positions. The real race was for 2nd place, where Estero topped Sarasota by 3 points, 100 to 103.